In Potosí, Bolivia, most families survive on less than US$ 2 per day. The local indigenous community in this Andean city is economically dependent on mining — an infamously grueling and hazardous way of life here — but a nearby mine, the country’s largest, will close in just seven years. It’s no secret: This community will soon need new jobs — and ideally, jobs that don’t damage the environment in this impoverished region. 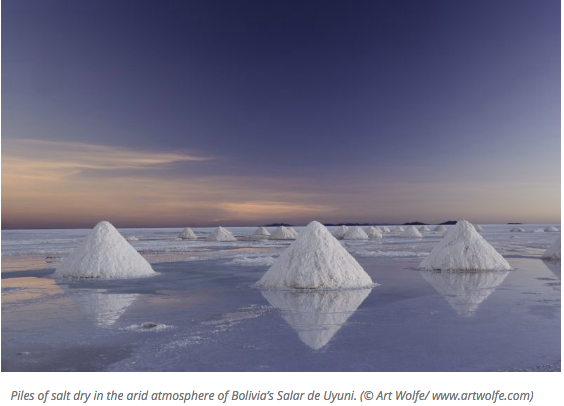 Fortunately, the nearby Uyuni salt flats — the world’s largest — are a few hours’ drive from the indigenous village in Potosí, and attract hundreds of thousands of tourists every year who have made the telegenic flats something of a social media star. Now, through a new project, Conservation International is helping indigenous peoples in the region to shift their economic dependence from mining to sustainable tourism, capitalizing on the draw of the salt flats. The project, which offers business management and hospitality training as well as discussions about gender roles and challenges, has helped indigenous women grow financially and emotionally. Mrs. Betty, the leader of a group of indigenous women taking part in the project, was able to open a café, which currently offers her family supplemental income that will be vital once the mine closes. “This has been the most radical change I’ve had in my life,” she said. Read more about Mrs. Betty and her story here. Olivia DeSmit is a staff writer for Conservation International. Bolivian Thoughts opinion: I have seen previous Conservation International’s projects in Bolivia and do like they continue to help us. Sustainable tourism is the only viable way for those miners and families. A shame that the Dakar race was held before in that region, as it caused a serious negative impact on biodiversity. People living in that area, must understand this and devote to provide a more ecological friendly tourism offer. This entry was posted in Bolivia, Business, Environment, Mining, Potosi, Tourism and tagged environmental awareness, government failures, sustainable development. Bookmark the permalink.